The Charlotte Observer has an article today about a rare $2 national banknote that we are auctioning on Saturday October 25th. You can read about the banknote and bid on the note from this page. We are currently accepting consignments for our next auction. We also buy banknotes outright. Email us at Info@ManifestAuctions.com or call us at 864-430-4020 to find out what your banknote is worth. Of all the cash that has passed through Charlotte’s banks, one of the rarest notes still in existence is going up for auction on Saturday. An auction house in Greenville, S.C., has opened bidding on a $2 bill issued in 1875 by the long-defunct Traders National Bank of Charlotte. The “Lazy Deuce” is one of just nine issued by a North Carolina bank that are known to exist, said Manning Garrett, president of Manifest Auctions. The note comes from a period from 1863 to 1878 when nationally chartered banks could issue their own currency, Garrett said. The bills, printed on sheets with three $1 bills and one $2 bill, were engraved in Washington and then distributed to the banks, where they were hand cut, he said. “Very few have survived,” Garrett said. Only two other notes are known to exist from Traders National Bank, he said. One is listed in poor condition, and the other is in a private collection. 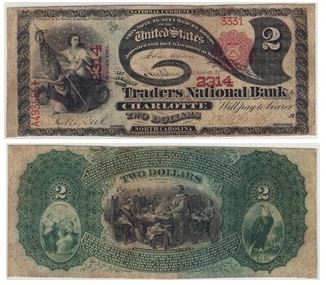 The estimated value of the Traders National Bank note is between $20,000 and $40,000, Garrett said. The only other known $2 bill from a Charlotte bank, Merchants and Farmers National Bank, sold at auction in 2007 for $40,000, he said. The little-known Traders National Bank is not one of the storied banks that later grew into Charlotte’s Bank of America or hometown rival First Union, now part of San Francisco-based Wells Fargo. An 1895 report by the U.S. Office of the Comptroller of the Currency indicates the bank went into voluntary liquidation in January 1883. Manifest Auctions informed Charlotte’s Levine Museum of the New South about the auction. But it doesn’t have the budget to acquire such an item, said registrar Janis Wilkens, who keeps track of the collection. The Traders National Bank note is of interest because the museum has an exhibit that includes material on Charlotte’s banking history, Wilkens said. Its collection already includes a couple of Confederate bank notes, a note from a Statesville bank and a $10 bill from First Union predecessor Union National Bank. “It’s a neat historical fact that banks once printed their own money,” she said. Garrett said the $2 note being auctioned came from the estate of a Pennsylvania woman.